One of my favorite discoveries, on entering the liturgical tradition, was the celebration of Advent. I was delighted to learn that dark December days and the light of a simple candle were heavy with meaning. In Advent, I found not a nebulous season of festivity ending in the anti-climax of Christmas morning, but a sacred waiting that leads to a twelve-day celebration of God’s presence. It’s what I always hoped the holidays could be. My daughter asked last night how long it was until her birthday, and I reminded her that Christmas comes before her birthday. She sighed and said, “Even one hour is hard to wait.” I remember that kind of anticipation, that bounce-on-your-toes joy, that spontaneous-hand-clapping excitement. I remember what it was like to wake up at 3 a.m. on Christmas morning, to stumble into the living room, to gasp at the beauty of the shining lights. There were so many gifts, and I had waited so long! My children are young enough to feel that kind of excitement. For them, the struggle is the wait. They don’t yet see the value in waiting; they don’t understand that as they wait for what they want, their desire grows. Their hope is enlarged. As Christmas approaches, they see more and more clearly what it is they long for. In their minds, that vision of the bike or the doll grows brighter, and their arms are opened wider to receive it. After three or four decades of living, my holiday struggle is different. I’m familiar with waiting. It’s the kind of waiting I do that’s the problem. My husband and I joke about the fact that we’ve lost the ability to get excited. A trip will be scheduled, or a concert or dinner. It’s something we know we’ll enjoy, but one week out, one night before, we’re too busy to feel even a vague sense of anticipation. We need our desires stirred, our hope renewed. We know that waiting is part of life, but do we really know what’s coming at the end of this wait? Do we bounce on our toes with joy when we picture the good things that are coming to us? 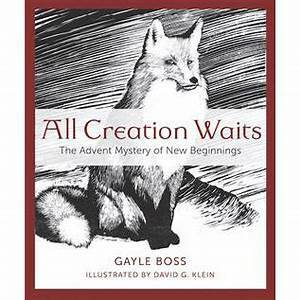 All Creation Waits is an advent devotional that simultaneously tempers my children’s hysterical excitement and stirs my sleeping hopes. On each day of Advent, Gayle Boss gives us a glimpse of how the world’s creatures wait. For them, waiting is a matter of life and death, and in their fierce struggle is a beautiful picture of faith. There’s the firefly, who has crawled through the dark earth for more than three hundred days before transforming and emerging into the warm air of a summer night. There’s the wood frog, whose liver plumps the cells of his body with a sugary syrup, lest they freeze and collapse during the cold days of winter. There’s the chipmunk, tucked in an underground nest, whose heartbeat slows from 350 beats per minute to just 15. He hardly breathes, conserving all his energy for those rare warm days when he can venture out to find food. Then, my favorite, there’s the painted turtle, who settles into torpor in an oxygen-starved environment at the bottom of a marsh. The lactic acid that fills her small body requires her bones, her shell, to offer up their calcium. As she waits, she is dissolving, and yet she stays perfectly, quietly focused. During this Advent season, I hope to remind my children that there is value in waiting. I hope to remind myself of the great good I am waiting for. I am praying that my longing for Emmanuel would be stirred until I bounce on my toes and clap for joy. Those who sat in darkness have seen a great light. My friends, He is coming! Thank you, Helena, for this beautiful post. I’m so honored that you and your family have found your waiting deepened with the animals of All Creation Waits. Our family has been loving this book as well. Thanks, Helena, for putting fantastic words as to why! Thank you Helena for a terrific overview. I too love the Painted Turtle for the reasons you shared. This year, my reading of this book is more about how these creatures are guided totally by their instincts, and how far I fall short in being guided, on a daily basis, by the God of my understanding. I’m grateful for these wonderful examples of implicit trust.